This entry was posted on February 28, 2014, 8:13 am and is filed under data, The Echo Nest, zero ui. You can follow any responses to this entry through RSS 2.0. Both comments and pings are currently closed. Well, I didn’t draw them by hand, but yeah–easier to scribble names on a printed out map at the bar than to haul around a laptop, find a mapping program, etc. etc. my approach was similarly low-tech. I found a base map and then used Keynote to annotate each state. And the internet vindicates me. Everyone in the USA hates R. Kelly. There’s hope for America yet. 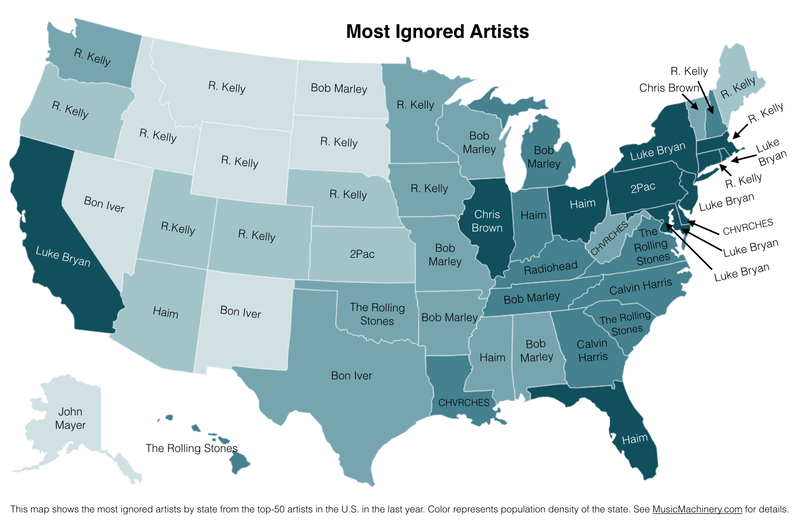 What I don’t understand: where do all the R. Kelly listeners live if all the states seem to ignore him?